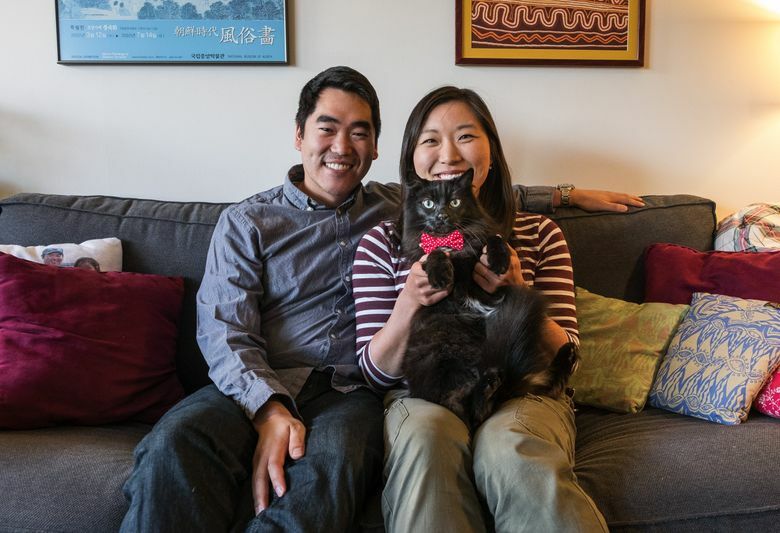 Suzie Kwon and Kevin Driscoll have a common millennial dilemma: They want to save up for a house, pay off student debt, sock away money for retirement, plan for children and find money to travel. That began to look a little overwhelming. After deciding to get married in July, Suzie Kwon and Kevin Driscoll started thinking about combining their money, and their talk soon turned to shared dreams and obligations. That’s when the Seattle couple’s financial anxiety began to rise. Kwon, 31, and Driscoll, 30, want to save up for a house, pay off Kwon’s student debt and sock away money for retirement. They also want to plan for children and have enough money left over to travel. That began to look a little overwhelming. As regular readers of The Seattle Times’ Money Makeover project, Kwon and Driscoll decided to apply for a free makeover. The Financial Planning Association of Puget Sound worked with The Times and put out a call for a planner who would advise the couple at no charge. Trish Howe, a financial planner with an office in Seattle’s Fremont neighborhood, volunteered. Young people often contend with a blizzard of financial decisions as they form households and make plans for the future. All of this occurs when their earning power is lower because they are early in their careers. “It kind of comes down the chute all at once,” Howe said of the financial decisions facing young adults. Fortunately, Kwon and Driscoll have chosen promising careers. In December Kwon earned a master’s degree in occupational therapy from the University of Washington. She’s currently working as an on-call occupational therapist at a Seattle hospital. Her pay before taxes and withholding varies, but it averages about $72,000 a year. Driscoll is an analyst for the industrial-engineering department of a Puget Sound aerospace company. His income before taxes and withholding is about $90,000 a year. Their combined income puts them at nearly twice King County’s projected 2016 median household income of $84,897, according to data the state Office of Financial Management released in March. The median household income in King County has increased 24 percent in five years. The couple’s income has not shielded them from financial stress, however. Kwon owes about $82,000 on 13 student loans with interest rates ranging from 2.6 to 6.8 percent. Her studies launched her career, but Kwon also sees the debt as an obstacle to other goals, such as homeownership. And the thought of buying a house is another source of anxiety in Seattle because of soaring home values. The couple want to buy a house in the city, yet double-digit increases in prices often make it seem like a receding dream. The median price for a single-family house in Seattle is now $729,000. A 20 percent down payment for a home at the current median price would be $146,000. “Overall, very discouraging,” Driscoll said. On the other hand, Driscoll is off to a good start on his retirement savings. He has about $119,000 in his 401(k) and another $2,500 in a Roth individual retirement account. He has a securities portfolio with about $38,800 in stock, and the couple keep about $9,000 in a reserve account. Kwon also has a workplace 401(k) account, but it contains less than $200 because she just started her career. Howe identified Kwon’s student debt as the couple’s most pressing issue. Retirement is 40 years away, Howe reasoned, and homeownership will be part of their retirement nest egg. Driscoll was socking away $18,000 a year into his retirement account, the maximum allowed for his age. Howe advised him to reduce his annual contribution to 8 percent of his salary, or about $8,800 a year, enough to take full advantage of his employer’s matching contribution. That freed up a little over $9,000 a year. Kwon and Driscoll are frugal enough to have a monthly surplus from their paychecks. That surplus, combined with the money that used to go to Driscoll’s 401(k), means they can spend $2,000 a month on paying down the debt and save another $2,000 a month for a house. Howe urged the couple to systematically pay off all 13 student loans, starting with the most expensive debt, in this case two student loans with an interest rate of 6.8 percent. When those loans are paid off in about six months, the couple will tackle the next most expensive student loan, and so on. At that rate, all of the interest-bearing student loans should be gone by the end of 2020. At the same time, the couple can accumulate a down payment on a home by socking away $2,000 a month, or $24,000 a year. In addition, Howe suggested that both Kwon and Driscoll augment their down-payment fund by opening Roth IRA accounts and each contributing $5,500 a year. Because savers have already paid taxes on money deposited in Roth IRAs, the Internal Revenue Service is more lenient about withdrawals. Roth IRA contributions — though not earnings — can be withdrawn at any time without taxes or penalties. That makes a Roth IRA a promising vehicle for saving a down payment, Howe said. The couple’s combined annual savings for a down payment — $11,000 in their Roth IRAs plus $24,000 — adds up to $35,000 a year. If they stick to the plan, Kwon and Driscoll should have more than $100,000 for a down payment in three years. Once they’re in a house, they can increase their retirement savings. Kwon and Driscoll have already started acting on Howe’s recommendations. Driscoll has reduced his 401(k) contributions and opened a Roth IRA. Kwon plans to open her Roth IRA soon.